Stone Sour have released a music video for an acoustic version of their track Mercy. 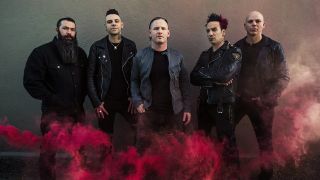 The song originally appeared on the band’s 2017 album Hydrograd, with the latest version appearing on the new deluxe edition of the record, which was released last week. Hydrograd deluxe edition features previously unreleased covers, live cuts, b-sides and alternative takes on some of the tracks. Speaking previously about the follow-up to House Of Gold & Bones Part 2, frontman Corey Taylor said: “We have six singles on this album. This album is great because it’s got elements of everything. It’s got the heavy energy of the 80s, there’s punk moments, there’s hard rock moments – all the great amalgam of music. Stone Sour are currently on the road across North America with Ozzy Osbourne on his No More Tours 2 run.